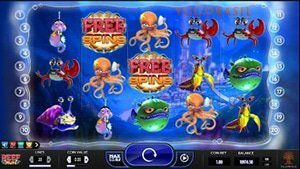 Reef Run is the new 3D slot by Yggdrasil, and you can get a $7 no deposit bonus for playing this game with a limited-time offer. All online players love to get something for nothing, and that's exactly what you can do to celebrate the first 3D slot offered by Yggrasil. Check out 7Red Casino and our exclusive $7 no deposit bonus for a chance to play a ton of the games that they have to offer including the new 3D Reef Run game powered by Yggrasil. Reef Run uses extremely impressive graphics to showcase a video slot adventure. There are 20 paylines with five reels and three rows in this deep-sea title, and you'll see a colorful cast of all kinds of different underwater creatures. The main bonus feature in this game is free spins, and there are multiple ways to enjoy them. You can get up to 60 free spins if you nail five of the bonus symbol, and while you're playing these free turns, you can get multipliers at levels of 1x, 5x, 10x or 20x to give you serious chances for some extremely impressive prizes. While this is the first 3D game to be released by Yggdrasil, it's the seventh game to be released in the past year that's made some serious waves in the industry. What Yggdrasil is showing is that what they lack in quantity is being more than compensated for in the quality department, and they're showing that their skills at making exceptional online games is no joke. Since 2010, 7Red Casino has been giving players a great selection of games to choose from including those from multiple software providers, and it has given companies like Yggdrasil a chance to showcase their skills. If you're wanting a shot at the Reef Run game and other titles, then check out their $7 no deposit bonus offer. This is only going to be available for a limited time, so you need to make sure that you get in on the action to get your chance at winning something for nothing with awesome games like the new 3D slot Reef Run.